Jakarta: Even though his body helplessly lay on the bed, his eyes were still able to warmly welcome us. 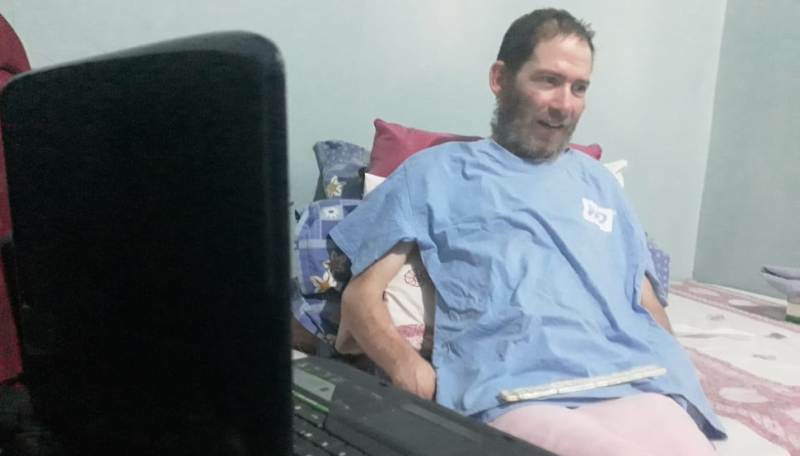 An American citizen named George Pritting is suffering a rare disease. When he was visited by Medcom.id on Tuesday, September 4, 2018, Pritting couldn't move freely. The tennessean could only communicate by pointing at letter blocks. According to the 46-year-old man, he is totally at the mercy of his friends. He doesn't have enough money to return to his home country. He arrived at Indonesia around six year ago. His body started to show the symptoms of Amyotrophic Lateral Sclerosis (ALS) a year later. ALS causes the death of neurons controlling voluntary muscles. It is characterized by a progressive degeneration of motor nerve cells. Currently, there is no cure for the disease. Besides that, there is no effective treatment to tackle the progression of the disease. According to him, his family still live in the United States. However, his mother has been diagnosed with some form of cardiovascular disease. "My family have given up years ago. I need money for treatment. I need to return to my country," Pritting said at the beginning of our conversation. Based on his testimony, the US embassy didn't give any solution to resolve his predicament. Moreover, US officials even took his passport as a quarantee for his loan to them. "They took my passport after I borrowed money for treatment. I don't have money anymore. I've spent all of my money two years ago," he said. "When I asked about my return, the embassy always had excuses. They are very slow. They are waiting for my death," he said. He needs hundreds of thousands of dollars for his return. It includes the costs of inflight medical services. Every day, he is assisted by three non-medical caregivers. Two of them accompany him from morning to evening. The other one stays with him at night. According to one of the caregivers named Eva, he can only eats liquid foods. He is still able to give a number of simple instructions. He also still has a sharp mind. Pritting lives alone in a rental room in South Jakarta. His friends help him to raise money to pay his bills.